Inspiring words, yes, but sometimes one can get carried away. 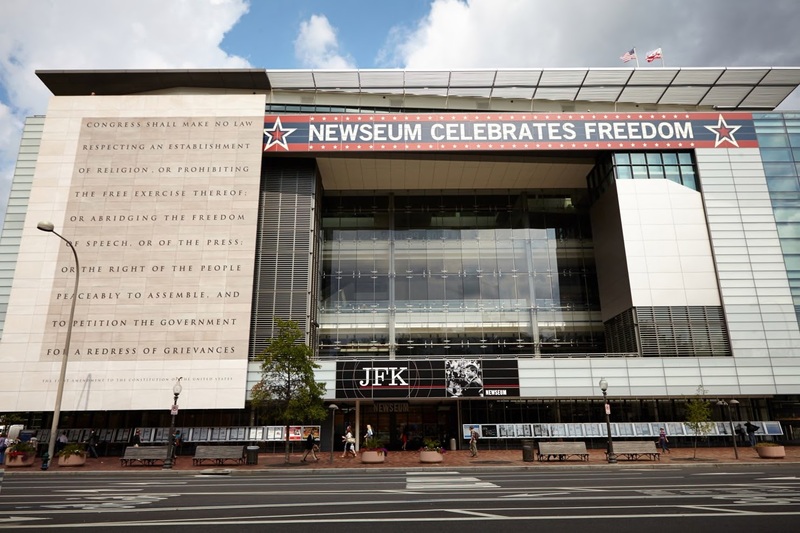 There are few better examples than the Newseum, the iconic edifice that opened its Pennsylvania Avenue doors in 2008 and has been awash in red ink ever since. The Newseum is in big financial trouble. It may have to sell its building — still shiny and new. And, though no one is saying it publicly, it may end up going under altogether. The signs weren’t good from its overblown start. The building is seven stories tall with 250,000 square feet of exhibit space, 15 theaters and an adjoining multistory Wolfgang Puck restaurant. Relocated from a much smaller space in Arlington, the museum opened at a terrible time: 2008 was a year of precipitous advertising decline, and round after round of layoffs at newspapers and the other news organizations that had pledged to support it. “With a sense of timing that is either brilliant or comically disastrous, a cathedral to journalism is about to open its doors in Washington,” wrote Alan Rusbridger, the legendary editor of the Guardian. And Politico’s Jack Shafer, then at Slate, mocked it as the “Taj Mahal of journalism” and suggested boycotting its opening, considering the museum self-aggrandizing. But even with a hefty admission fee in a city of free museums, the Newseum’s interactive offerings have been popular with tourists. And its dedication to free expression and the First Amendment has been admirable. Trip Advisor lists it as a top Washington attraction, and it gets many raves from those who visit and submit reviews. Its collection of Pulitzer Prize-winning photographs is stirring, and its memorial to journalists who died doing their jobs is moving. After retiring from Gannett, for which he made a fortune by cutting back newsroom staffs and hiking ad rates to boost corporate profits, Neuharth took charge of the company’s charitable arm, the Gannett Foundation, turning it into the Freedom Forum. The Freedom Forum has had a huge endowment from the sale of Gannett stock, and that endowment is now threatened by the Newseum’s losses. In a statement Monday, the Freedom Forum told the dire news that — even after getting $500 million over the past 20 years from its parent foundation, and trimming its costs — the museum is losing money fast. “Left unchecked, this deficit spending rate would eventually drain the Freedom Forum’s entire endowment, and the annual cash drain prevents us from allocating any new capital to First Amendment programs that are at the heart of our educational mission,” it said. It doesn’t require a PhD in comparative literature to see the Newseum’s troubles as a metaphor for the besieged state of the American press. The First Amendment — whose words are etched impressively on the building’s exterior — is threatened by a media-hating president. The news industry’s financial turmoil continues. And many Americans mistrust the news media, even as many others cherish and support journalists’ watchdog role.